Ingeteam, an independent global supplier of electrical conversion and turbine control equipment, announced today that it just opened a new facility in the vicinity of Chennai to satisfy the demand for wind power converters and control cabinets by both local and international OEMs with operations in India. 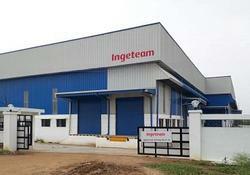 Located in the Tamil Nadu region, Ingeteam’s new 3,500 m² facility is equipped with state-of-the-art production technology. The production plant in India will manufacture electrical components following the same stringent standards and processes as Ingeteam’s other production facilities in Spain, USA and Brazil. The new facility has been specially developed to meet the needs of a promising and demanding market, such as India. This highly efficient as well as cost-effective production center is based on a modular design and can be easily modified. The production lines are extremely agile, so they can quickly be adapted to meet new client requirements. In addition, the floor space availability will enable Ingeteam to expand the facility on demand. Production at the new facility started in August, with first deliveries made in September. Serial production started in October. “With this new plant, we are able to increase our delivery of reliable and quality products to wind turbine manufacturers in India’s extremely competitive market. The decision to manufacture locally was marked by the potential of the Indian market, by its protectionism and by the high potential of its people”, said Ana Goyen, Director of Ingeteam Wind Energy. “We will be there to serve our clients with the same parameters of quality, reliability and competitiveness that have always been at the core of Ingeteam. This is a further strategic step to positioning ourselves in this rapidly growing but legally secure market as the world’s leading supplier of wind power converters,” she continued. Ingeteam entered the emerging Indian wind energy sector very early on, and now holds a 9% market share in the country. In 2017, a staggering 35% of the 4,148 MW wind capacity installed in India that year was equipped with Ingeteam’s technology. “Although the Indian wind market has slowed down due to regulatory and commercial issues, we have no doubt that it will pick up again and continue with the positive overall growth trend it has set over the past few years. The fundamentals of growth are there and this market remains a key area of investment for Ingeteam in the long run,” commented Goyen. India is a developing country with a growing need for energy and with limited fossil resources. For this reason, the Indian government has prioritized the development of renewable energies, particularly wind and solar energy. The drastic reduction in energy prices has demonstrated the success of this policy. The Indian market is expected to resume its fast development, as the government seeks to meet its targets of 175 GW of renewable capacity by 2022, with 60 GW of that coming from wind energy alone. With this expansion, the Spanish company has secured its position as a provider of operation and maintenance services to energy generation plants with a global presence in 22 countries.